Used on most Gresley era passenger stock and continued to be used into the BR period. Catering vehicls and sleeping cars usually rode on the heavy duty version of this bogie. See MJT 2412A . 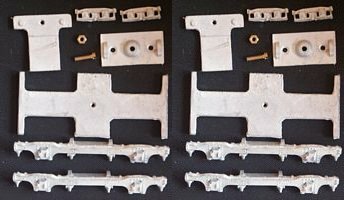 As an alternative, cosmetic sides MJT 2411 can be used with a rigid bogie frame MJT 2556 to make a rigid version of this bogie.